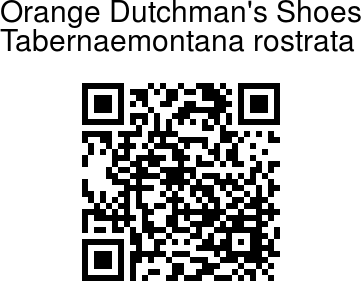 Orange Dutchman's Shoes is a shrub, 0.5-2 m tall, stem 1.5-2 cm in diameter. Leaves are elliptical to narrowly elliptic, 4-23 cm x 1-8.5 cm, 2.2-4.5 times longer than wide, tip long-pointed, stalk 0.2-2 cm long. Inflorescence is lax, 2-12 cm x 2-5 cm, 2-15-flowered. 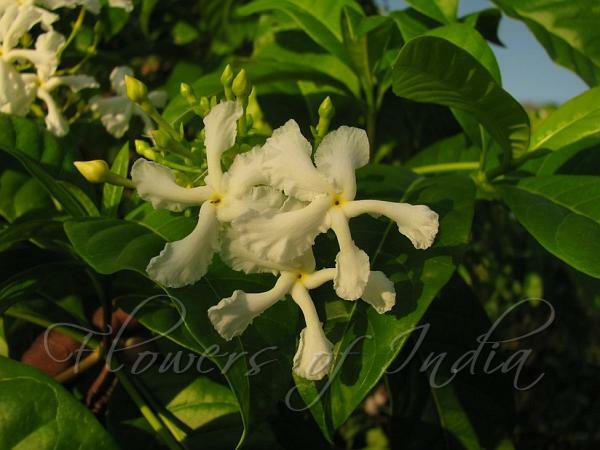 Flowers are fragrant or not, open during the night. Sepals are pale green, leafy-like. Flower-tube in mature bud is 1.4-2.6 cm long with a wide broadly ovoid head for 20-35% of the length, tip blunt, tube 1.8-4(-6) times longer than the calyx, 1.3-2.2 cm long, twisted 0.5 turn or not just below the anthers. Fruit consists of 2 separate mericarps, pod-like, orange or red, several-seeded, splitting open.